PLUS 2018 ‘Holiday Bliss' focuses on something we believe is important to celebrate, time spent with family, by combining the flavors of shortbread cookies and cranberry jam. 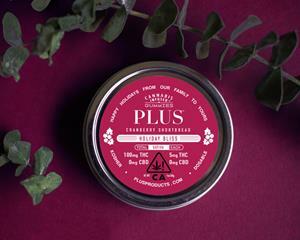 ADELANTO, Calif., Nov. 09, 2018 (GLOBE NEWSWIRE) -- Plus Products Inc. (CSE:PLUS) (the "Company" or "PLUS") today announced Cranberry Shortbread cannabis-infused gummies, its latest special edition, will be in stores for the 2018 Holiday season. A perfect gift for everyone from the novice to the highly experienced cannabis user, PLUS Cranberry Shortbread gummies are dosable, discrete, and delicious. "At PLUS, we believe that if you want to build a brand that can extend from California to other states, you need to start by making products that improve people's lives, said Jake Heimark, CEO. "Our 2018 ‘Holiday Bliss' focuses on something we believe is important to celebrate, time spent with family, by combining the flavors of shortbread cookies and cranberry jam. We wanted to bring a bit of that spirit to California at the close of 2018, as we hope to bring the spirit of PLUS to the rest of the country next year." The Company's mission is to make cannabis safe and approachable - that starts with manufacturing high-quality products delivering consistent experiences. All products are produced in the Company's dedicated food-safe cannabis manufacturing facility in southern California.